In the year 2075, mankind has reached a point where journeying between Earth, the moon and the space stations is part of daily life. However, the progression of technology in space has also resulted in the problem of the space debris, which can cause excessive and even catastrophic damage to spacecrafts and equipment. 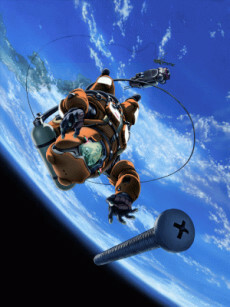 This is the story of Technora's Debris Collecting section, its EVA worker, Hachirota "Hachimaki" Hoshino, and the newcomer to the group, Ai Tanabe. A unique piece of hard(er than most) sci fi anime that is well worth the time, despite a few hiccups.